One of my goals for this project was to use reclaimed materials. It was unrealistic for me to use nothing but reclaimed materials but where I could, I did. 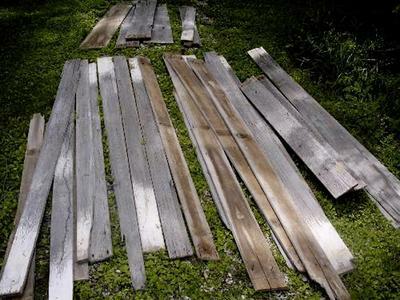 One area that easily lends itself to reclaimed materials is the siding. Many of the treehouses I saw in books and on the web used old barn lumber as the exterior siding. I decided this would be a great fit for our project. The siding for the treehouse consists of old barn lumber from at least four different barns originally located in southern Indiana. Some of the lumber still had traces of old paint but was mostly weathered clean. 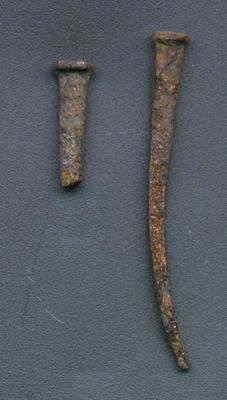 A couple of the boards had square nails ( A.K.A. 'cut nails') in them. From what I have read, these nails were last used in 1910; so, using these nails as an indicator, some of this wood is 100 years old. My mother was responsible for tracking down all of this lumber. She was able to beg, borrow, and buy in part through a unique service called 'Tradio'. Tradio is a service where you send the local radio station (WFLQ) a list of your goods for sale, or in our case, a list of "looking for" items. At scheduled times during the week, the radio station will read these want/need lists over the air. Listeners then connect the dots by calling the sellers/buyers directly. 60% of the siding lumber was obtained through this service for a modest cost. 39.5% of the siding was donated by a family friend, Carol. The remaining lumber was taken from the property of my childhood nemesis. We originally planned to paint the outside of the siding to match the color of the house. After getting it all up, we fell in love with the rustic cabin feel and decided to leave it unpainted (for this year at least). 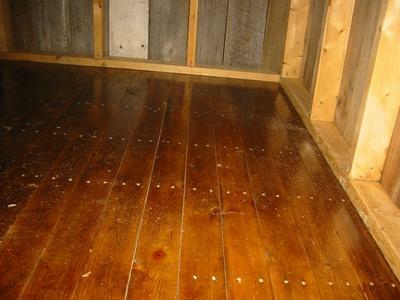 The floors (described in the first article) were stained. 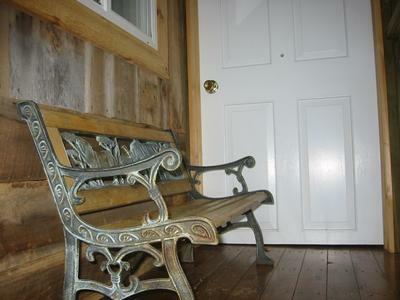 Once dry, three coats of semi-gloss polyurethane were applied. This gives the floor a finished —but not too shiny—appearance. Maybe too nice for a treehouse, but what the heck...? The ladder was the last part of the treehouse to be built. 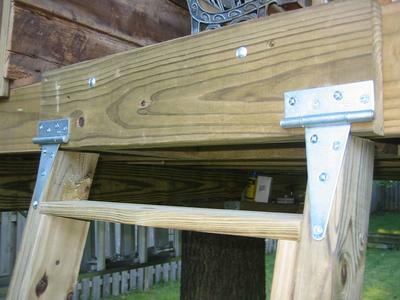 The ladder extends from the edge of the porch to the ground at a 75 degree angle. By slightly pitching the ladder, you don't feel like you are stepping off a cliff when you climb down. An additional feature, the ladder is double-hinged. This double-hinging allows the ladder to fold into itself as it is folded up (think of how the ladder to your attic works). When the ladder is folded up, it also acts as a gate at the end of the deck. Future plans for the ladder will include some sort of pulley system so that the ladder can be hoisted up from within the treehouse. > My wife and kids for not only doing a fair amount of work, but more importantly providing me with the inspiration for starting the project in the first place. > If my father-in-law charged his hourly rate for all the time he put in on this project, this would be a quarter-million dollar treehouse. I'm not exaggerating. Alvin, thanks for all the blood and sweat you shed for this project - I loved working with you (and this is better than any lemonade stand Erin could have ever dreamed of when she was little)! > Mom, Carol, Shelley for donating time, energy, and materials. 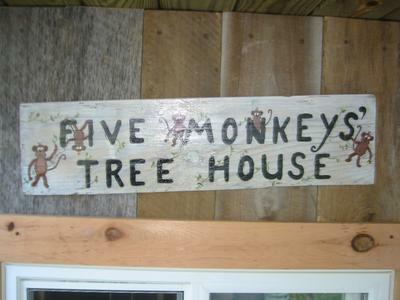 For driving up loads of wood from Southern Indiana on afternoons too nice to be stuck in a car and for making a perfect sign for the treehouse. 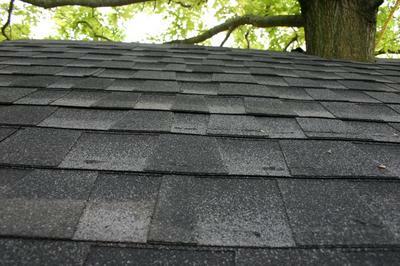 > Thanks again to Bone-Dry Roofing, Inc. for the generous donation of shingles and needed supplies for the roof. > Matt & Jess, thanks for putting the "POW" in the power tools. Without the beefed up tools I'm sure that I would still be up in the tree. > Mike & Robbin, thanks for lending me your ladder for the better half of the summer. This was an essential piece of equipment. > Ryan & Abby, thanks for all of your help —starting even before the first board was hoisted. This is the sort of neighborhood project that will keep the kids entertained for years to come. > Woodie, I appreciate all of the sagely construction advice you gave me throughout the summer. Your guidance helped me shore up many of the loose ends in my design. > Jay, thanks for looking at my initial sketches and strengthening the overall design. Getting this early feedback really helped to shape the end result. > My cousin Josh, thanks for all of the enthusiasm and word-of-mouth buzz that you have given the project even while studying for (and taking) the bar exam ! 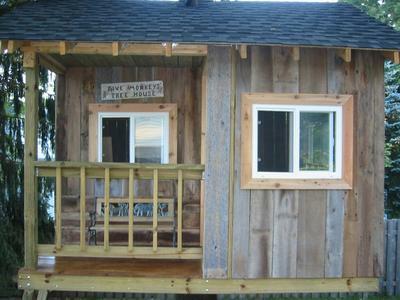 Great job Brent, the treehouse is more than any kid or grown up could ever dream. It was so much fun, yes even trekking up that huge hill with lumber in the hot ! !, glad to have been a part of this project. Ditto from Carol and Shelley. Can't wait to camp out with the kids next summer :) Proud to be the Mom !! Brent - all kids should be so lucky to have a dad as dedicated as you! The tree house looks great and Matt and I are glad our Power Tools were finally used to build something instead of just used for fixing. We can't wait for our new arrival to be able to enjoy the house some day too. I will have to say this is much better than the tree house...for lack of better words....that I remember in our tree when we were kids. The one you nailed fabric into the branches. HAHA!! Congrats on this project. Wow, it is awesome. Any time to come to Chas. to build an addition, just let me know. Oh yea, thanks for encouraging me to go up in the treehouse, even before there was a ladder, right bro! That would sell for $200,000.00 in Charleston. Great Job everyone. VERY nice job! After seeing your tree house floor, I only have one question: You wouldn't be interested in doing a kitchen floor, would you? Can't wait to see it in person. Well your dream come true, its been my dream. I have a tree in my backyard here in Panama, ready to have a treehouse soon, thanks to your website. Thank you. ill send you pictures as soon as its done. I don't remember how your picnic table turned out in Jr. High shop class, but Bob Hanes would be proud of your tree house.